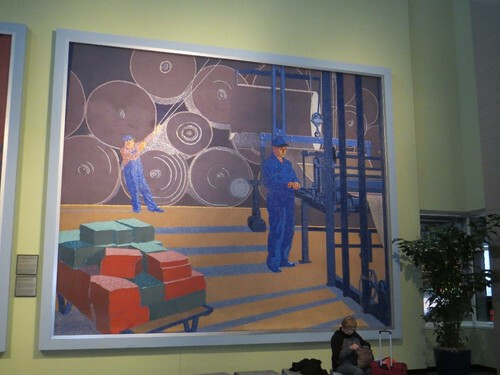 DIGNITY OF LABOR: EPIC MOSAIC MURALS, ONCE AT UNION TERMINAL AND NOW AT THE AIRPORT, DIGNIFY THE WORKING MAN. 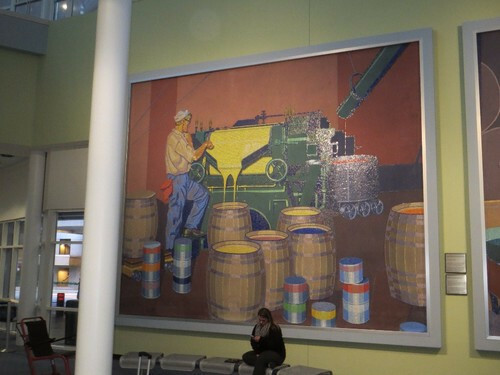 EPIC MOSAIC MURALS, ONCE AT UNION TERMINAL AND NOW AT THE AIRPORT, DIGNIFY THE WORKING MAN. 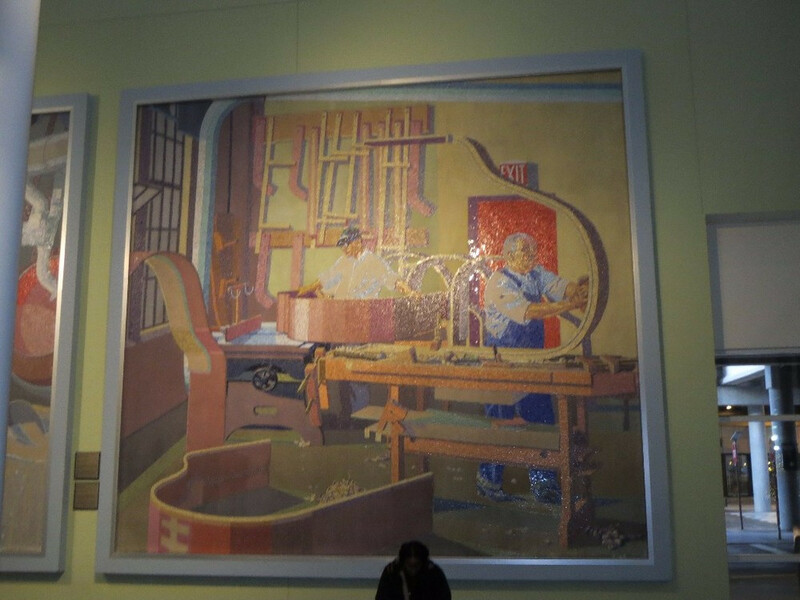 These murals depict robust men executing trades of industry in clean clothes and full light, prepared for dirt and sweat, while enhancing quality of life in society. There is something magnificent about these murals and their message, which is that working with both body and mind is glorious. What young child would not want to emulate those men? I certainly did. What parent would not want their child to do so? As our culture submits to the wonder of electronics, the virtue of physical labor is dissipating. Properly deploying one's body - back, legs, shoulders, and hands, to tasks of importance is an art-form, developed through practice and example. Though contemporary culture currently values mind over body, the pendulum will swing back someday. Are not some of our fondest memories working outside or in the kitchen with a parent or grandparent, learning rudimentary but essential skills? These memorable activities tend to be low-skilled at the outset, but lead to high performance down the road. They lay the foundation upon which excellence can rest someday. How would a delicious meal be generated from a kitchen without: cleaning, ordering, chopping, slicing, dicing, counting, weighing, sweeping, arranging, and setting? Each of these tasks does not require great skill, but executed together and in proper sequence create the foundation for the skilled cooking and delicious meal that finally arrive at the table. The initial steps can not be forsaken, as the essence of the meal starts with them. When we taste delicious food, we can recall it commenced with the mundane. The same is true on the farm. 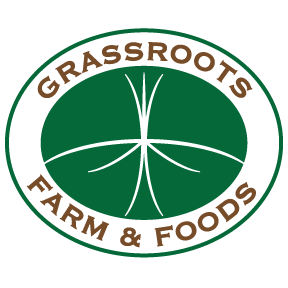 When we sell you grassfed foods, we can trace the quality back to repetitive daily tasks of: feeding, moving, repairing, building, monitoring, and amending. Each task does not require developed skill and can be delegated to the inexperienced. But all tasks are connected, and if one is not properly executed, it can quickly spill over to the next to create a conflagration. Careful execution of daily tasks is essential to integrity of the final product. It is caring about each step, no matter how physical or uninteresting, that is so important. The men in the murals seem to care; men and women on farms represented at the Farmers Market care immensely, and therein lies the honor. It is highly honorable to perform manual labor carefully and skillfully. Berea College, in central Kentucky, cites Dignity of Labor as one of its eight Great Commitments or core values. Private and state universities would do well to emulate Berea, which outwardly professes that excellence starts with manual and mental labor and the willingness to perform dirty work. Isn't that a different approach to education? There is another dimension to physical labor, which is that our bodies are made for it. One of the attractions of farming is that it it employs both mind and body. Farmers don't have to go to the gym to come into balance. But for those who do go to the gym, the activity is honorable, in that doing so attends to the body, one of the pillars of well-being, with others being mind, spirit, and soul. We look forward to seeing you this Sunday, December 6, at the Winter Farmers Market in Hyde Park, at Clark Montessori. We will not be in attendance the following week of the 13th, as we will be sitting at the feet of Allan Savory - a mentor, who is presenting at White Oaks Farm, near Columbus, Georgia. 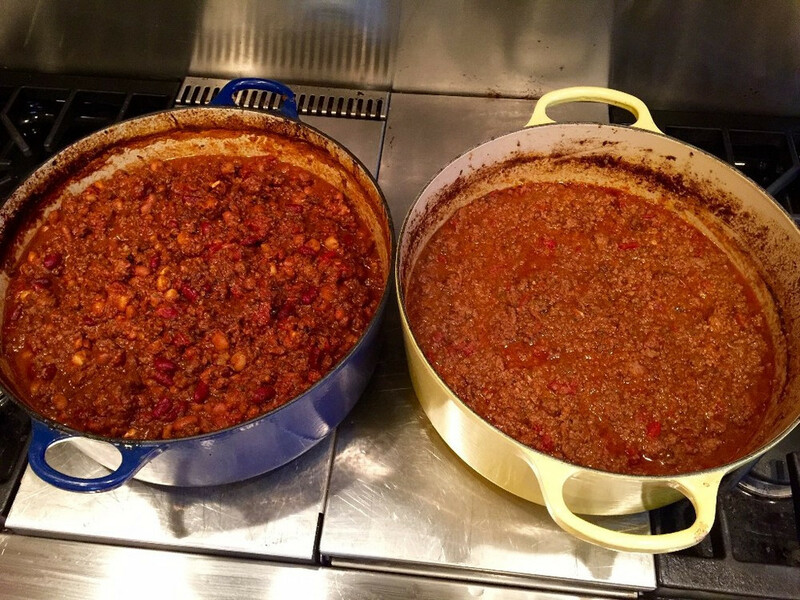 The picture below is of dueling pots of nurture - grassfed chili on the left and Bolognese Sauce on the right. 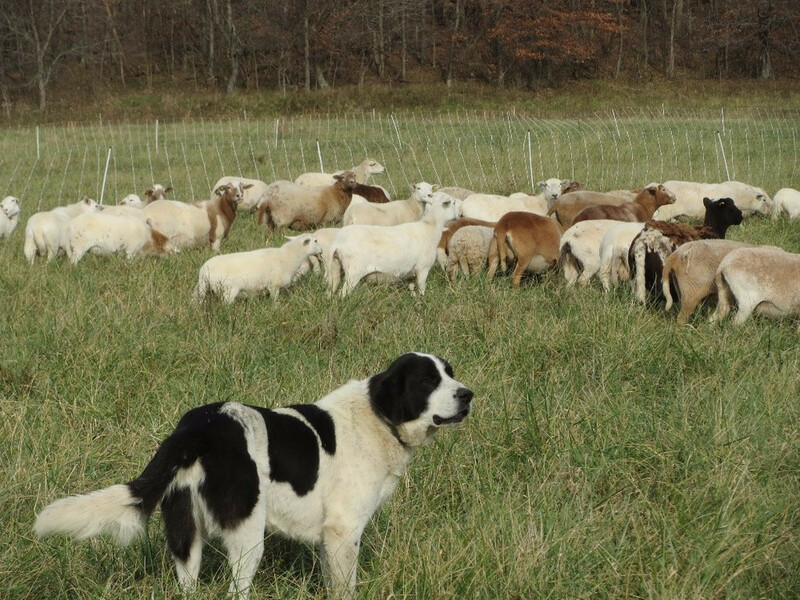 DECEMBER LAMB: AS THE MONTH TURNS, EWES AND LAMBS, ARE DEEP IN GRASS, PREPARING FOR NEXT STEPS. 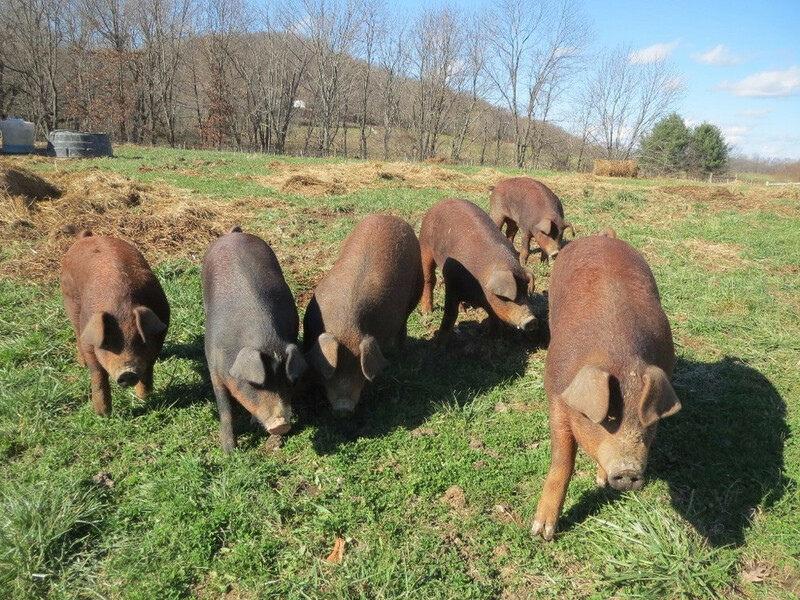 POWER OF PORK: OUR FIRST FOUR HOGS WILL BE PROCESSED THIS COMING MONDAY. 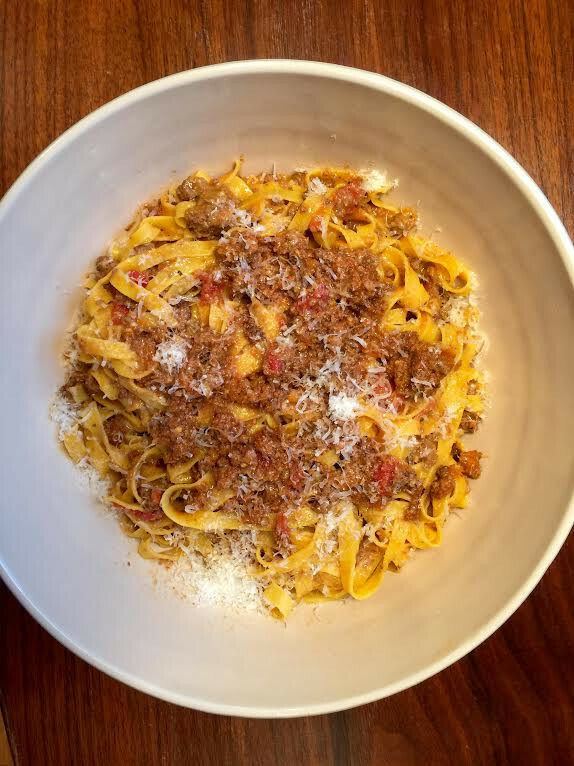 BOLOGNESE: BOLOGNESE SAUCE IS TRAVELING FROM BOLOGNA TO CINCINNATI, VIA THE GRASSROOTS KITCHEN!